The birth of Slovak professional theatre with the establishment of the Slovak National Theatre in 1920 strengthened the claim for a professional theatre in Slovakia’s second city of Košice, which could pride itself on a theatre building that was just as beautiful as Bratislava’s. Until this time the demand for culture in the metropolis of Eastern Slovakia had been met mainly by touring Hungarian and German theatre companies. The first season of the 1920s incorporated a so-called Slovak season with performances of the SND in Košice, while other months belonged to guest Hungarian and German theatre companies. The origins of the State Theatre, Košice may be traced back to 1924, when the Východoslovenské národné divadlo (VND, East Slovak National Theatre) was established in Košice under the leadership of Ján Slávik with a vision of being a force for education and nation building. The director of theatre was Czech director Josef Hurt and the season began on 13 September 1924 with a performance of Chalupka’s comedy Kocúrkovo. Only operetta was performed in the 1924-1925 season. The first opera production – Smetana’s The Bartered Bride – had its premiere in the 1925-1926 season. In the same season the theatre presented Gounod’s Faust, Puccini’s Madame Butterfly and Halévy’s La Juive. Despite efforts to consolidate the range and artistic standards of the repertoire, Josef Hurt remained director for only two years, resigning from the position as a result of unbearable financial problems. He was succeeded for two seasons by the private entrepreneur Otto Alfieri and then by Otakar Novák, a private entrepreneur with many years of experience directing a touring theatre company. During his only season in Košice (1928-1929) he sought to raise the level of the theatre and the quality of its dramatic and sung repertoire, in which opera achieved greater prominence alongside operetta. Although the theatre became more stable artistically, the theatre’s insurmountable financial problems, the public’s lack of interest and their unfavourable reflection in his personal life became so unbearable for Novák as director that after a year they drove him to suicide. Six weeks after Novák’s tragic death, the company of the East Slovak National Theatre published “A Commemorative Certificate of the East Slovak National Theatre Company” in the Slovenský Východ and Národný Denník newspapers justifying their decision to end the coming 1929-1930 season. The famous Czech actor Karel Želenský and his son Drahoš Želenský attempted, as a private business, to prevent the breakup of the VND, which owed more to financial circumstances than a lack of artistic effort. They signed a contract for three seasons with the aim of performing an ambitious dramatic and musical theatre repertoire with quality companies. The state authorities did not approve Želenský’s ideas, however, as they would require larger subsidies. 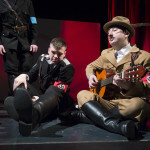 Relations between the management of the theatre and the company also worsened. In 1930 the VND’s independent existence came to an end and the Bratislava SND took over the performances of the Slovak season and the subsidies that had been intended for Košice. For the next seven years the SND and the Olomouc Theatre alternated as guests in the City Theatre building. Increasing demand for the renewal of the VND resulted in a decision of cultural institutions and the East Slovakia regional government to grant the concession to the director of the SND, Antonín Drašar. The theatre thus entered the first season of a new stage in its existence in 1937. Czech director Jaroslav Skála became head of the drama company, and conductor Juraj Viliam Schöffer took charge of operetta. The operetta company was almost entirely Czech, including only two Slovaks who would later go on to become founder members of the post-war Košice company, Anton Matejcek and Ernest Kostelník. It was planned that opera performances would continue to be provided by the visiting SND. In the end, the activity of the VND was curtailed by the events of the war and the incorporation of Košice into Horthy’s Hungary. In 1945 the establishment of an independent State Theatre under the leadership of the bard of Slovak theatre, Janko Borodác, inaugurated a new chapter in the history of opera in the eastern Slovak metropolis. The first premiere in the new theatre was Nedbal’s Polish Blood. In the following decades the Košice company successfully overcame initial difficulties to build an ensemble of soloists and chorus and establish a reputation in the world of Czechoslovak opera. The founding generation, lead by prima donna Gizela Veclová and tenor Imrich Godin, who came to Košice after a great career in the Vienna State Opera, in the first seasons included Bohumila Argalášová, Viera Gregorová, Mária Peršlová, Hynek Rohan, Ladislav Kucko, Jozef Staník, Imrich Gál and Anton Matejcek. 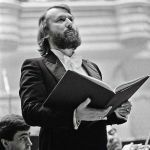 Until the start of the 1980s the most prominent member of the opera company at the State Theatre was the excellent conductor Ladislav Holoubek. In the years 1954-1965, before his departure to the SND, Branislav Kriška directed some notable productions here (Jenufa, Betrothal in a Monastery, The Storm, Fidelio, Confusion in Ephesus, Resurrection…). In the 1970s Drahomíra Bargárová was a model director for the company. Her exciting Otello is a classic of Slovak opera direction. 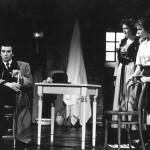 In the 1980s the young graduate in opera direction Marián Chudovský entered the Slovak opera milieu, producing strongly theatrical productions (The Elixir of Love, The Two Foscaris, Petrified, The Cunning Little Vixen). From the 1950s to the 1970s, the main pillars of the company were Helena Gmucová, Elena Likérová, Eva Šmáliková, Anna Poláková, Gita Abrahámová, Božena Hanáková, Olga Golovková, Mária Adamcová, Jozef Regec, Oswald Bugel, Imrich Jakubek, Stanislav Martiš, Ladislav Pacaj, Anton Hucik, Karol Marecek, Miroslav Hájek, Ladislav Neshyba sr and Gabriel Zelenay. The most important of the next generation of singers were Alžbeta Mrázová, Eliška Pappová, Mária Harnádková, Jozef Konder, Pavol Mauréry, František Belún and Juraj Šomorjai. The world famous bass Sergej Kopcák also began his career in Košice. At the end of the 1980s and the start of the 1990s, the opera in Košice experienced hard times as a result of the reconstruction of the historic theatre building (1987-1995). The unsightly environment of its temporary accommodation in the Cultural Centre led to a loss of audience interest and negatively influenced all elements of the opera ensemble. After the return to the restored Historical building the theatre is slowly regaining its audience and consolidating soloist ensemble and collective elements. 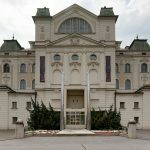 There have been more people at the head of the Košice opera in the past two decades, among them Frantisek Balún, Zuzana Lacková, Karol Kevický and Peter Dvorský. At present the head of the opera is Karol Kevický again. The theatre traditionally concentrates mainly on titles in the operatic repertoire that are attractive for audiences and also regularly performs classical operettas. 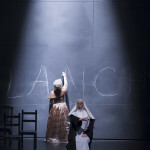 The most significant recent artistic performances include the Slovak premiere of Poulenc’s Dialogues of the Carmelites, awarded the Best Production of the Season 2013/2014, directed by Linda Keprtová.